This letter was enclosed with a $25 donation. 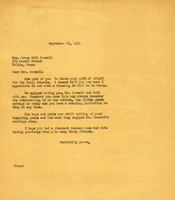 This letter is in response to one that Mrs. Curry received from Martha Berry. Miss Berry is thanking Mr. Growell for his $20.00 donation and for his poems, which have inspired the students. She also tells him that he is welcome to visit (and stay for a spell) any time he wishes. Anna V. Crawford, partially out of gratitude for a Christmas gift of cotton and somewhat out of charity, is sending Miss Berry a check, so as to aid in the reconstruction necessary following the recent storm. M.S.H. Bowles asks to hear about a student named Sam because she has donated money on this student's behalf. 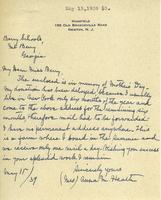 Ms. Houser is writing to Miss Berry to instruct her to use ten of the twelve enclosed dollars to help one "Case Number 3" get and education and to use the other two dollars to buy a subscription to a magazine called "Pathfinder", which could be added to the library. 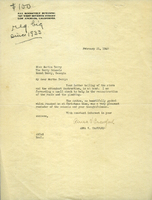 A postcard from the American Forest Magazine informing Berry School of a donation from Mrs. Chas V. Hickox and telling the school of their donation. The author expresses his wish that he could give more money to the school and hopes that he can hear more about the work that the schools are doing when he is in better health. Mrs. Heath says that she is enclosing a donation in memory of Mother's Day. She says that her donation has been delayed because she has no permanent mailing address and mail had to be forwarded to her. Allie K. Haymaker sent a check for $10 to Martha Berry and told her to use to the money for anything that it is in need for. Mrs Day sends a $10 check, and regrets she couldn't send more. She writes that she hopes that Miss Berry and her work are doing well. 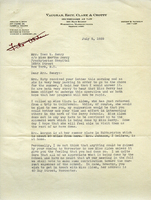 Letter from Edward T. Esty to Mrs. Henry explaining that a visit from Martha Berry, as she planned on making, would be unnecessary because they are already determined to make a donation for Berry School. 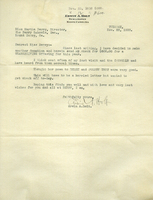 A letter to Martha Berry thanking her for her hospitality towards her daughter and daughter's husband when they visited in addition to a donation check. Hornblower is advising Miss Berry of a donation of National Georaphic magazines to the school. Erwin A. Holt sends a donation check of $600 for a Thanksgiving offering, discussing his last visit to Berry.